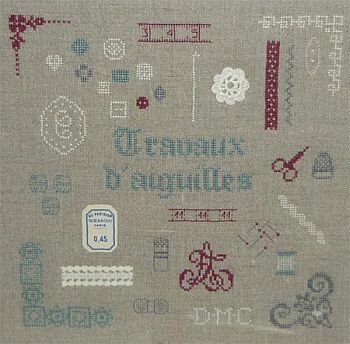 "Needlework" is a cross-stitch chart with instructions translated in English. What we like about this design: not only the composition is lovely but there are all these small patterns that can be re-used for another project. Please note that this design is composed of various patterns all stitched on linen using only one strand of cotton over one thread of fabric. You can of course work it in full size on the fabric of your choice but then you may find that the provided accessories are a bit small and wish to replace them. Special stitches: This is a cross-stitch design with some back stitches. This pattern shows 4 colours (DMC numbers on the chart). The model on the picture has been stitched on a 40 count linen fabric (colour "natural linen") as a miniature using one strand of cotton over one thread of fabric. Recommended Fabric: of your choice regarding the stitch count and the type (linen, evenweave, aida) colour "natural linen, 45x45 cm (18x18 in).